1. Eve, Even, Evening, Eventide : شام - شام کا وقت : (noun) the latter part of the day (the period of decreasing daylight from late afternoon until nightfall). Kirdar, Part : Part : the actions and activities assigned to or required or expected of a person or group. "The function of a teacher"
Hissa : Part : the part played by a person in bringing about a result. "I am proud of my contribution in advancing the project"
Tukra : Part : something less than the whole of a human artifact. "The rear part of the house"
Mang : Part : a line of scalp that can be seen when sections of hair are combed in opposite directions. "She pulls off a middle part"
Hissa, Darja : Part : one of the portions into which something is regarded as divided and which together constitute a whole. "The written part of the exam"
Kirdar : Part : an actor`s portrayal of someone in a play. "She played the part of Desdemona"
How this page explains Sham Ka Waqt ? We help you understand the word Sham Ka Waqt in English. We not only provide English meaning of شام کا وقت but also give extensive definition in English language. 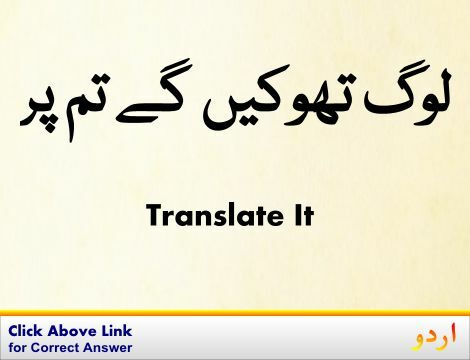 You can also find multiple synonyms or similar words along with Sham Ka Waqt. You may also want to see Android app to get شام کا وقت, please install Wordinn Urdu Android app now.